This is a team on the verge of a meltdown. There are those, and Red Bull is one of them, who say that the bonhomie between Lewis Hamilton and Jenson Button is entirely forced. It’s a PR dog-and-pony show to make the legendarily fractious and unhappy McLaren team suddenly seem like the cool kids, who just love racing, winning, and each other. Maybe so, but I have never seen a McLaren team so laid-back and consistent as this one. The fact is that most of us who watch F1 can recognize when fault lines form within a team, and this year it’s Red Bull that’s cracking, not McLaren. It’s worth considering why. There are three key differences between the two teams, and I’m not sure how Red Bull can address any of them. The first is that McLaren has 2009 World Champion Jenson Button driving alongside 2008 World Champion Lewis Hamilton. Both these drivers have secured a space in F1 history and have vastly less to prove than Mark Webber or Sebastian Vettel. That’s not to say Button or Hamilton are not driven, they most certainly are. But it does mean that Hamilton and Button are secure about themselves and within their team in ways that Vettel and Webber are not. Vettel is young, impetuous, and probably flabbergasted at how his heretofore over-the-hill teammate has launched an attack on the championship. Webber has been kicked around a bit in his career and is more defensive because of it, and when this year began he looked like a marked man at Red Bull. The second key difference is one of personal style. Button and Hamilton are entirely different sorts of drivers. Button is less inspired and more consistent, a man who has made a study of driving rather than relying on instinct. He is not a fighter, though he can pick his way through a field when he needs to, and he will not drive beyond the limits of a car. Hamilton, on the other hand, is samurai. He has been trained from childhood to be a race driver, and a highly aggressive one. He is prone to lapses in judgment and flashes of temper, but he will drive the wheels off a car and wring every extra hundredth of a second from it. Put someone in front him and tell him to have at it, and he will do whatever it takes to get the position. Vettel and Webber are both more in the Hamilton mold, and I’m not sure either possesses all his strengths while they definitely copy his weaknesses. They are aggressive to the point of stupidity. At Valencia two weeks ago, Webber drove onto the back of Heikki Kovaleinen’s Lotus and sent himself flying into the nearest wall. It was an entirely avoidable collision, but it was vintage Webber: a reckless charge into someone’s tail. 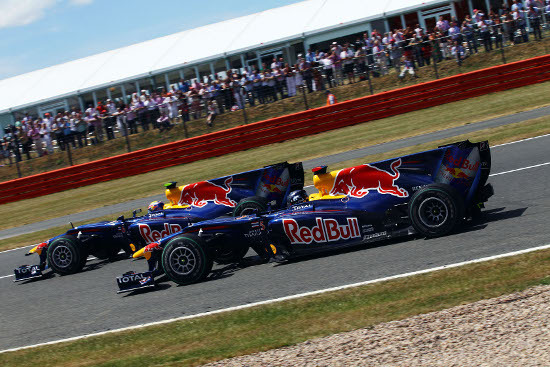 A few weeks before that incident, Vettel managed to ruin Red Bull’s entire race by trying to force his way past Webber, and then swerving into him to try and regain the racing line. Red Bull had a lock on first and second until Vettel botched this pass. Webber finished third and Vettel didn’t finish at all. But most unbelievably, and this brings us to the third point, Red Bull tried to blame the incident on Webber. Despite the fact that the entire world saw Vettel drive into Webber, the initial reaction from Red Bull leadership was some bizarre song and dance about Webber lapping slower and having turned his engine down to conserve fuel. Therefore, the theory went, he was obligated to let Vettel past. 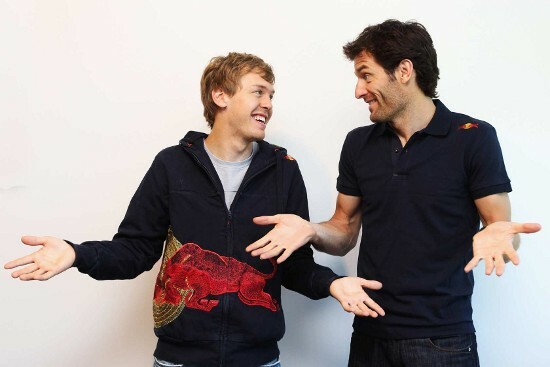 Perhaps, but Webber drove in a straight line and Vettel hit him. There is no way to spin that. Hell, Webber didn’t even force Vettel to try the inside of the straight. Vettel had his pick of lines and went for the one barely wide enough for his car. Then he juked into his teammate. You can watch it here. Contact happens at about 1:25, but the whole thing is worth watching. You can see the Vettel is faster but, you also see that’s irrelevant given what happened. Strangely, this photo did not actually solve the problems brewing at Red Bull. The reason this matters is because Webber and his fans believe that Webber is not getting fair treatment from his team. Even the commentators on FOX Sunday were making the comment that the word was the Austrian leadership of the Red Bull organization have a thumb firmly on Vettel’s side of the scale. This weekend, for instance, Red Bull brought two new front wings to Silverstone, one for each driver. In a strange mishap, Vettel’s broke. It slid right off its mountings while he was driving. Anyway, the team’s reaction was to immediately take the wing from Webber’s car and give it to Vettel. The official explanation is that the team’s aerodynamicist, the legendary Adrian Newey, needed race data on the new wing and so one of these two drivers was damned well going to drive it. I accept that explanation, but why give it to Vettel? It was neither driver’s fault that the wing broke, but why turn the incident into one that punished Webber? I’ve never had much trouble with teams favoring one driver over another. The reason Schumacher got better treatment at Ferrari than Rubens Barrichello is that Schumacher was a better, more consistent driver. Rubens was treated shabbily at times, yes, but there was no doubt that he was the number two driver. This is how F1 teams work: one driver takes the lead and gets first call on new upgrades and race strategy. The other driver lags behind a bit. But it only works if there is a clear hierarchy that makes sense to both drivers. Where the drivers are equally successful and both fighting for championship points, the team has to step aside and let them sort things out on the track, with only one rule: don’t take each other out. Red Bull can be forgiven for coming into this season thinking of Vettel as their primary driver, but the season should have changed that assessment. It changed everyone else’s. I don’t know how you begin sorting this out. The team leadership has already fouled this situation up, and so Horner and his people aren’t really in a position to say, “Knock it off.” They’re part of the problem. But so is Webber, because while he shouldn’t be treated like a number two driver, he doesn’t act like a number one. His conduct after qualifying and after this race was classless, and only served to underline his distaste for his team. The same team that put him in a winning car, set it up, maintained it, and serviced it during the race. Perhaps Horner should get his walking papers for mishandling this personnel issue so badly. Let him fall on the sword and then signal a fresh start with someone else. But here’s the bitter irony over at Red Bull this year: they’re hands down the best team. This is a successful, dominant formula for victory, and nobody over there should want to rock the boat. But they’ve let rot set into the team, and it’s already destroyed the ability of the two drivers to trust one another. When these guys line up next to each other on the grid, each has to worry about the other sticking a knife in his back. Webber wasn’t even allowed to catch up and lap Vettel in traffic Sunday, for fear the two would clash. Red Bull has the best car by a half second a lap this season, and they’re in danger of losing the constructor’s championship because they’ve set their drivers against one another. The only thing to do now is to treat each driver equally and hope that restores peace. Otherwise it’s going to be a long, ugly off-season leading to an even uglier racing season in 2011.